Photo by Brandon Macz: WSDOT has still not decided whether it will add construction time and cost to spare the Montlake Market from demolition. It is feasible to preserve the Montlake Market and still reconfigure Montlake Boulevard during the next phase of the SR 520 Bridge Replacement and HOV Program, but it will add millions to the project. 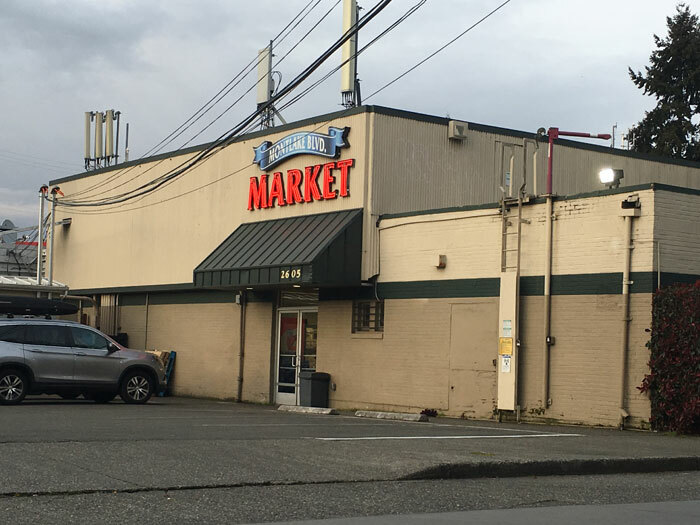 Whether public opinion captured in a community survey conducted by WSDOT will sway the transportation department or fuel another push in Olympia to spare the neighborhood market from the wrecking ball remains to be seen. The Montlake phase of the SR 520 replacement includes a new West Approach Bridge South for eastbound traffic that will connect to the floating bridge over Lake Washington, a lid over 520 and a bicycle/pedestrian land bridge east of the lid that connects the Washington Park Arboretum and East Montlake Park. The Montlake Market was removed and later added back into plans for a reconfiguration of Montlake Boulevard, which caused an outcry from the neighborhood and legal challenges. The Legislature passed a proviso in 2018 directing WSDOT to preserve the market if possible. WSDOT provided the public with design options in January that would preserve the market, at which point it launched a survey that ended on Feb. 14. Forty-one people took the survey that night, and another 1,688 weighed in before the survey closed. Two-thirds of respondents were from Montlake, Madison Park, north Capitol Hill, Portage Bay and Eastlake. Keeping the market building upright and operational is estimated to add 45 days to the project — about $50,000 more per day — which is estimated at $15.3 million to $20 million in added cost. WSDOT interprets the legislative proviso as requesting the transportation department address preserving the building, and not the business. Just keeping the building, leaving it vacant and not operating during construction, is estimated to cost $7 million to $10.15 million. The building could be reused later, or surplused and sold to the highest bidder. The transportation department awarded Graham Contracting Ltd the design-build contract for the project in October. Even as the lowest bidder, the cost came out to $455.35 million, which was $30 million more than WSDOT’s highest estimate for the project. Half of the survey respondents said they wouldn’t mind adding 45 days of construction to keep Montlake Market operating, and 25 percent said they would still accept the delay even if only the building were preserved. About 10 percent would accept an increased timeline of 31-45 days. Two-thirds of respondents cited the loss of Montlake Market and its neighborhood amenities as their highest concern for community effects, and a quarter said their concern was travel and construction impacts from preserving the market. Twenty-five percent of survey respondents said they would accept a project cost increase of $20 million or more, 20 percent were fine with up to $10 million, and 10 percent found an increase of $10 million to $20 million acceptable. Forty-four percent of respondents said it wasn’t worth it to preserve the building if the Montlake Market is unable to continue operating. People also provided written comments, with 451 expressing a desire to save Montlake Market and 211 writing against preservation. WSDOT takes ownership of the property this summer. Another public meeting is expected before then to provide an update on the property’s fate. The survey report has been provided to WSDOT senior leadership, Seattle representatives and Washington legislators for review.